Equality is supreme. I believe that the balancing of act of right versus wrong, good clashing with evil, and justice triumphing over injustice is a performance, acted out by hostile characters. Both factions are always to destroy the other, but it is a process that cannot happen. One cannot exist without the other, for if there were no injustice, there would be no justice. The same can be said for good and evil or even life and death. I am puzzled when people tell me, “Do not say that you hate, for hate is a strong word,” but I am also told to love more. I do believe that both of these terms are used too loosely I believe that these two emotions are mutually intertwined with each other. To recognize true hatred, you must know unconditional love. Fortunately, in most of our lives we are able to establish a baseline for that love from family members. The same passion that we express from love is the same passion that is needed to hate something or someone. Without loss there is no winning and without failure there is no success. 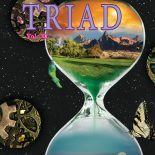 This entry was posted on October 27, 2013 by hcctriadme in Non-Fiction, Triad 2013.